Many people regard design services for renovating their home or office as a luxury. It is something most of us fantasize about, gazing at photos on Houzz, Pinterest or Instagram, inserting ourselves into imaginary scenes of impeccably designed spaces, overlooking stunning natural vistas. Unfortunately, the path to attaining such spaces for living and working often seems obstructed, the fantasy unattainable and yet forever etched in our minds as a place of escape. Fortunately for designers and potential clients, there is emerging data that quantitatively measures well-designed space, and its effect on our mental and physical health. And while most of us are not able to ditch our lives and build a custom home nestled into a cliff overlooking the ocean, there are many ways that we can make our existing spaces healthier, more productive, comfortable, functional, and uplifting. Dr. Esther Sternberg, in her 2010 book Healing Spaces: The Science of Place and Well-Being, uncovers clear relationships between our senses, emotions and immune system, in a discipline that can be described as a neurobiology of the senses. From rooms with natural views, to lighting, sound and functionality, Sternberg explores ways in which the design of a hospital room directly affects a patient’s ability to heal. Her ideas also point toward possibilities for designing whole health centers and communities that would focus on emotional health (and its inarguable connection to our physical health), stress reduction, and peace. If having a well-designed space seems like an all-or-nothing endeavor, it doesn’t need to. Even revamping individual rooms like a kitchen or home-office, or replacing lighting and flooring in a workspace, can have a deeply positive affect on our daily experience. Why can’t we have our cake and eat it, too? While I will never give up my fantasy of the concrete and glass stilt house in the forest over a ravine, I am still happy working on a custom sofa design, whose prototype will hopefully end up in my living room. 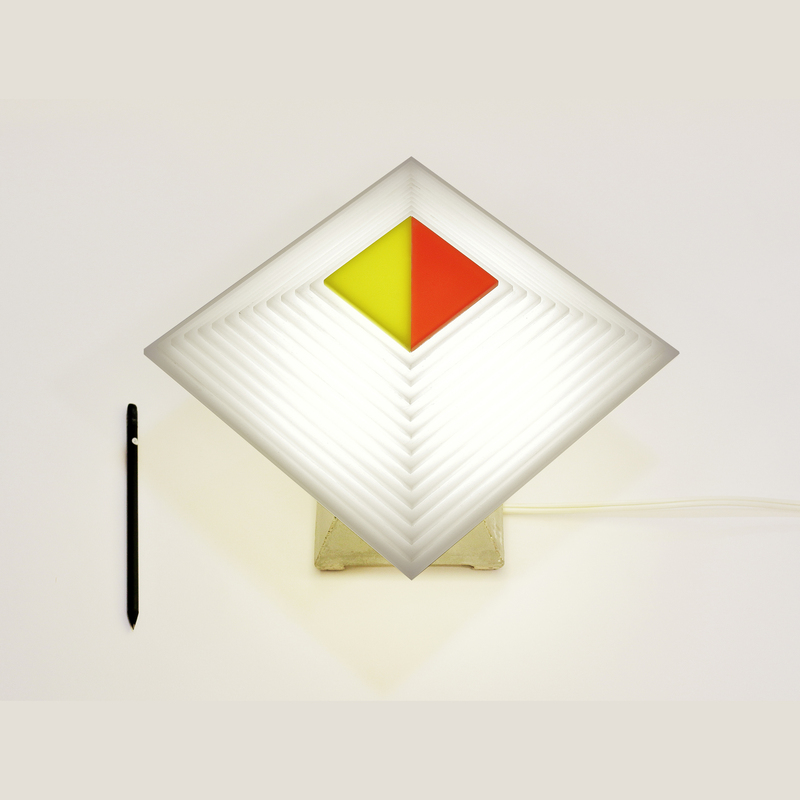 Every bit of good design counts. Categories: Uncategorized	| Comments Off on INTERVIEWS! Here is the catalog showcasing the designers at the upcoming show & shop for the League of Women Designers. Catalog design by Daniela Markova Soukup. 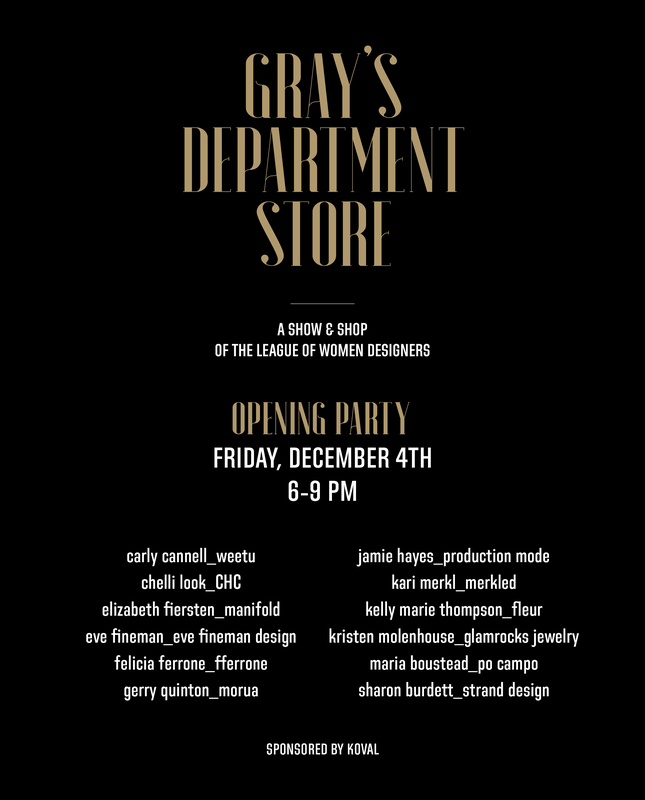 I have curated a show for the League of Women Designers – Chicago. Partipating designers include: Carly Cannell of Weetu, Chelli Look of CHC, Elizabeth Fiersten of Manifold, Eve Fineman of Eve Fineman Design, Felicia Ferrone of fferrone, Gerry Quinton of Morua, Jamie Hayes of Production Mode, Kari Merkl of Merkled, Kelly Marie Thompson of Fleur, Kristen Molenhouse of Glamrocks Jewelry, Maria Boustead of Po Campo, Sharon Burdett of Strand Design, Sonia Yoon of Midnight Kitchen Projects, and Theodora Nvotas of Yasou. and designer of furniture, textiles and interiors. Her influential works in the 1920s and 1930s were largely overlooked in her time and the importance of her legacy remains unrecognized to this day. One of her most innovative works, the Villa E-1027 house, for instance, was first attributed to her lover, Jean Badovice, and was later defaced by the most famous architect of her day, Le Corbusier. Gray’s point of view is particularly relevant to the show’s philosophy. She believed in the “dwelling as a living organism”, a holistic approach to design that put the experience of living at the center. “It is not a matter of simply constructing beautiful ensembles of lines, but above all, dwellings for people.” She brought a much needed sensuality and beauty to the modernist movement that feels fresh to this day. 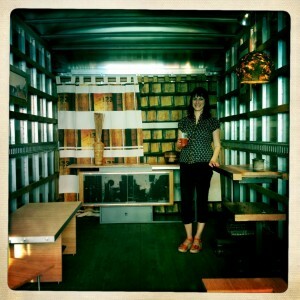 EF f+i shared a truck with DeRussy Designs at Chicago’s 8th annual Guerrilla Truck show, concurrent with NeoCon. THIS SHOW displays living spaces inside a Chicago storefront gallery, whereby every piece of furniture and all textiles, artwork and accessories are made by local artisans. 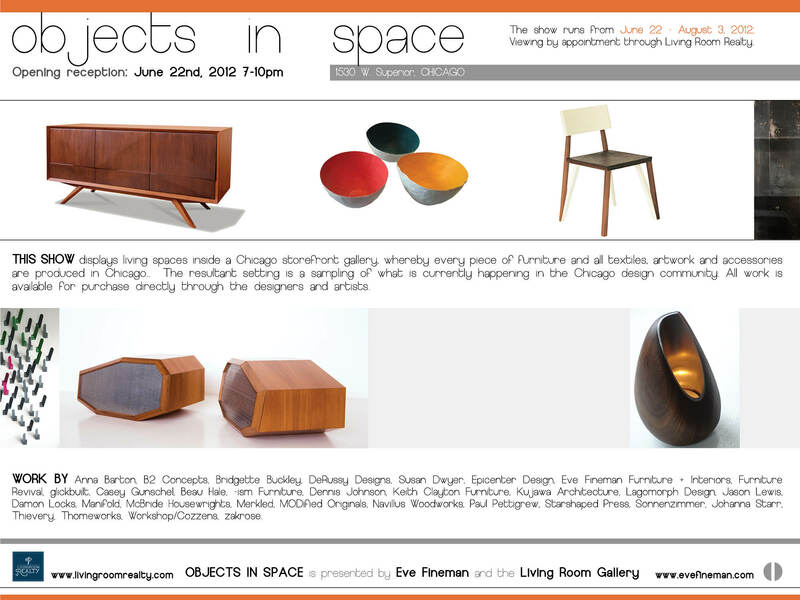 The resultant setting is a sampling of what is currently happening in the Chicago design community. All work is available for purchase directly through the designers and artists. WORK BY Anna Barton, B2 Concepts, Bridgette Buckley, DeRussy Designs, Susan Dwyer, Epicenter Design, Eve Fineman Furniture + Interiors, Furniture Revival, glickbuilt, Casey Gunschel, Beau Hale, -ism Furniture, Dennis Johnson, Keith Clayton Furniture, Casimir Kujawa, Lagomorph Design, Jason Lewis, Damon Locks, Manifold, McBride Housewrights, Markled, MODified Originals, Navillus Woodworks, Paul PettiGrew, Starshaped Press, Johanna Starr, Sonnenzimmer, Thievery, Thomeworks, Workshop/Cozzens, zakrose.